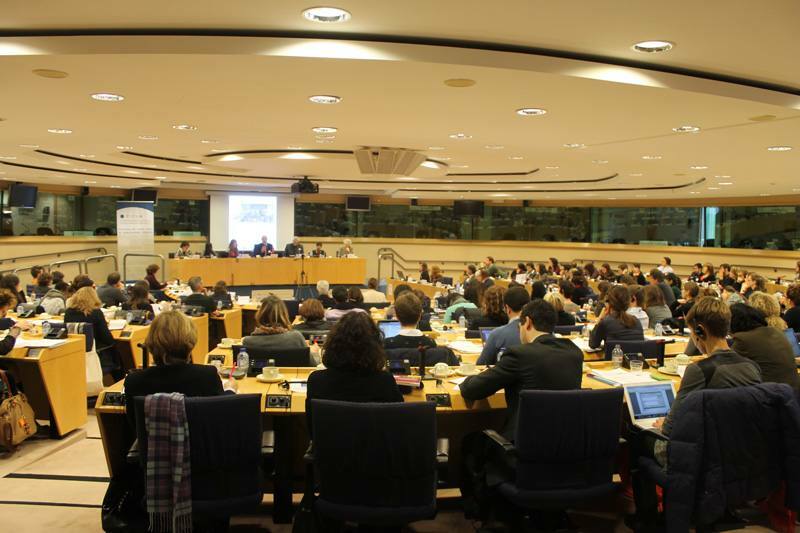 A public hearing considering the role of the European Union institutions in ensuring the rights of undocumented migrant children and their families, was held at the European Parliament in Brussels, November 14, 2013. The Platform for International Cooperation on Undocumented Migrants (PICUM) together with French MEP Nathalie Griesbeck, Group of the Alliance of Liberals and Democrats for Europe (ALDE) and the International Detention Coalition discussed the role of EU institutions to fulfill their legal obligations under the United Nations Convention on the Rights of the Child to ensure protection and access to basic rights and services for undocumented migrant children and cease their immigration detention. IDC Advocacy Coordinator, Ben Lewis, spoke about the emerging global consensus that children and families should never be detained for migration related reasons and highlighted the IDC’s CCAP model as a practical way forward for states to “expeditiously and completely” cease the practice of child and family detention in conformity with recent guidance from the CRC. Lewis also highlighted the IDC’s global campaign to end child detention as a way for NGOs and other stakeholders to get involved and help raise awareness of this important issue. Undocumented children face a triple vulnerability as migrants, as they have irregular status, and as children. In many EU member states, there has been a dangerous trend to prioritise immigration control over the rights of undocumented children and their families. Child rights remain largely absent in migration policies and practices, with little systematic consideration of the impacts of policies on children. This is the case when authorities make decisions to grant or refuse status, to detain, to deport, or to restrict access to essential services such as health care and education. At the same time, in many countries, undocumented children are not considered by, or are even excluded from, public policies and services. As a result, undocumented children are often deprived of their basic rights and entitlements and left in precarious situations facing poverty and exclusion, with long-term impacts on their health, well-being and development. The Committee on Social Rights, which oversees the application of the European Social Charter, has issued key decisions on the social rights of undocumented children. Although the Charter was not originally foreseen to apply for irregularly residing migrants, the Committee has found that certain rights are so linked to human dignity that it would be contrary to the Charter, a human rights instrument, to deny these rights due to residence status. The Committee has found, in four separate cases so far, that governments should provide rights to undocumented children on their territories.